Fruit grower Ken Morrish was left stunned when he found a golden delicious apple on his tree split exactly half green, half red down the middle. The apple has caused such a stir in the village of Colaton Raleigh, Devon, that Mr Morrish is inundated with neighbours queuing up to take pictures of it. Mr Morrish, 72, who has been harvesting the apples from trees in his garden for 45 years, said: "It's truly amazing. 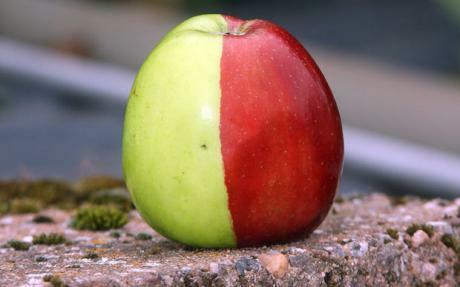 "It looks as if a green apple and a red apple has been cut in half and stuck together." He said that he was out picking a few apples for his sister-in-law when he spotted the fruit hanging from a bough. Mr Morrish, a retired painter and decorator, added: "I couldn't believe my eyes. The red and green split through the stem is totally perfect – as if I've painted it. "It's a genuine one-off and none of us have ever seen an apple like it before." Experts believe that the odds of finding an apple with such a perfect line between the green and the red are more than a million to one. In such cases, the red side usually tastes sweeter than the green side – because it has seen more sunshine during its growth. John Breach, chairman of the British Independent Fruit Growers Association, told the Daily Mail: "I've never seen this happen before to a golden delicious. It is extremely rare. It is an extreme mutation. "There has been the occasional case of this type reported. If there was a whole branch of apples with the same colouring then fruit experts would get even more excited." Jim Arbury, fruit superintendent at RHS Garden Wisley in Surrey, said it was probably the "result of a random genetic mutation". "This is known as a chimera where one of the first two cells has developed differently giving rise to one half of the apple being different," he said. "It is unlikely to be a stable mutation but it is worth checking next year to see if it recurs. There are instances of some striped apples and pears where the mutation remains stable including one striped pear in the collection at Wisley called Pysanka."